A number of factors can influence whether a young athlete lives up to his or her potential in sports. As a sports parent, Brad Tebbutt of Portland, Ore. faces a classic challenge: His 12-year-old son, Jordan, doesn’t play basketball to the best of his abilities. A number of factors can influence whether a young athlete lives up to his or her potential in sports. In this case, Jordan’s issue is a common one: He worries too much about whether his coach approves of his performance. “He has really struggled to play up to his potential,” says Tebbutt. “He is obsessed with, ‘Am I doing the right things? Will I get approval from the coach? Will he like what I do? Will he bench me?'”? Because Jordan is very driven, he assumes his coaches expect a lot from him, Tebbutt adds. When young athletes like Jordan worry so much about “doing the right thing,” they’re wrapped up in a failure-oriented approach to sports. They concentrate too much on avoiding mistakes. Rather than focusing so much on what they did or could do wrong, young athletes need to aim for success. Sports parents can help kids do this. Parents should begin by talking to the child about what he or she worries about. Help the child pinpoint his or her fears. Does the child worry about being teased, benched or criticized? Point out that this is a failure-oriented approach to sports, and suggest that the athlete focus more on success. It’s also helpful if parents give their kids permission to make mistakes. Tell them it’s okay to drop the ball or air a free-throw shot from time to time. Remind them that everyone commits these blunders. But athletes who recover quickly, shake off the mistake and move on are most likely to build confidence and succeed. Parents should also help their child identify small goals that will help them aim for success. In basketball, those goals might include improving his or her free-throw percentage or grabbing more rebounds. When the child or teen is on the court, he or she should concentrate on reaching for these targets. When a young athlete is focused on tasks like snatching rebounds or stealing the ball, he’ll likely enjoy the game more. He’ll find that he’s more focused on the here-and-now, as opposed to worrying about the future-what Coach will think of me after I make this shot. When a child or teen athlete focuses on such small goals and gets into the “Zen” of sports, he’s changing how he thinks while he plays. His mind is full of positive goals, rather than negative worries. Taking on small goals is a critical step toward becoming a success-oriented player. Dony Wilcher, Jordan’s basketball coach and program director for Showtime Athletics, Portland, Ore., says he’s asked Jordan to try out this strategy. And it has paid off. As Jordan continues with this approach, he’ll likely build even more confidence. He’ll worry less about the coach’s opinion. He’ll tell himself, “It’s okay to make mistakes.” He’ll embrace success, rather than avoiding failure. Dr. Patrick Cohn and Lisa Cohn are founders of The Ultimate Sports Parent. 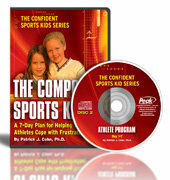 Listen to their radio show and download their free e-book, “Ten Tips to Improve Confidence and Success in Young Athletes,” by visiting www.youthsportspsychology.com.